We were challenged to apply Contextual Design methods to design a novel interactive application to support people carrying out an information-intensive activity in a home, school, or office context. My team decided to design an application to assist people with shopping for groceries and other household items, which still occurs nearly exclusively in physical stores despite the increase in online shopping in other retail sectors. Therefore, we focused on designing a solution that would support and enhance in-store shopping experiences. Contextual Design is a customer-centered process that uses field observations to understand and model people’s current work practices, in order to design an improved solution that supports users’ tasks and needs while resolving breakdowns. Our target user population was broad: anyone shopping for groceries and other household items in retail stores. We gathered field data through one-on-one contextual inquiry sessions conducted with multiple users, ranging in age, gender, marital/family status, and occupation. We each shadowed a user to observe and learn from them throughout a shopping experience from start to finish: creating shopping lists at home, shopping for items in stores, and returning home with purchased items. During the observations, we recorded extensive notes and asked questions as necessary to clarify the user’s actions, intents, and thought processes. After each contextual inquiry session, my team conducted a group interpretation session to review the field observations recorded for each user. We translated the recorded observations into a set of coded notes, representing distinct pieces of data. Additional notes were recorded to capture team interpretations and insights, such as breakdowns in the user’s current practices, etc. 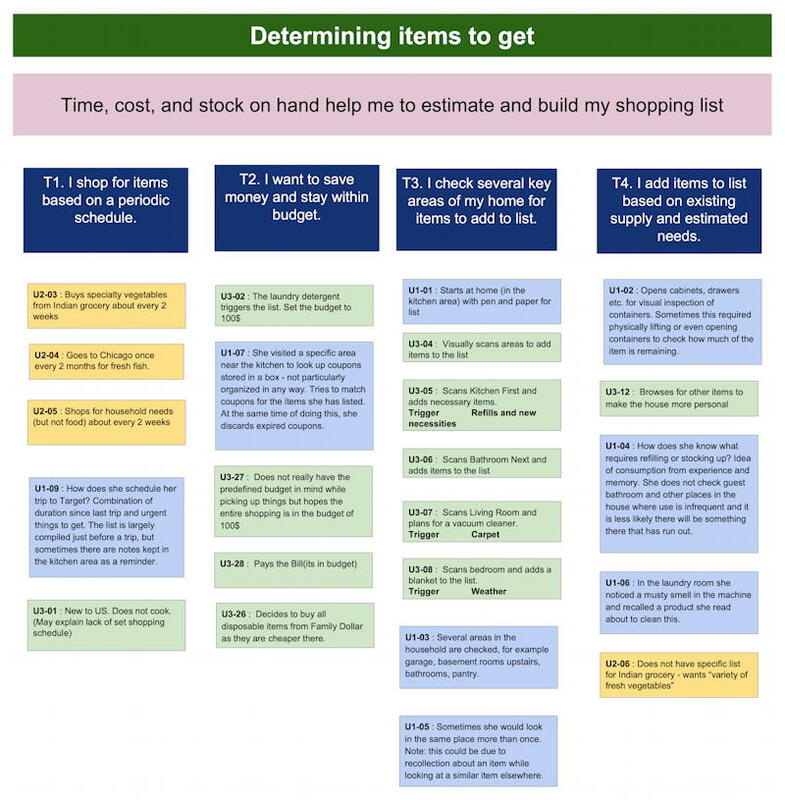 Sequence Model ‒ identifies the order of activities in the shopping experience, including the intents, triggers, and steps for each activity, as well as any breakdowns that occurred. For example, the first activity involves preparing and finalizing a shopping list, which may be triggered by running low on certain groceries or household items. 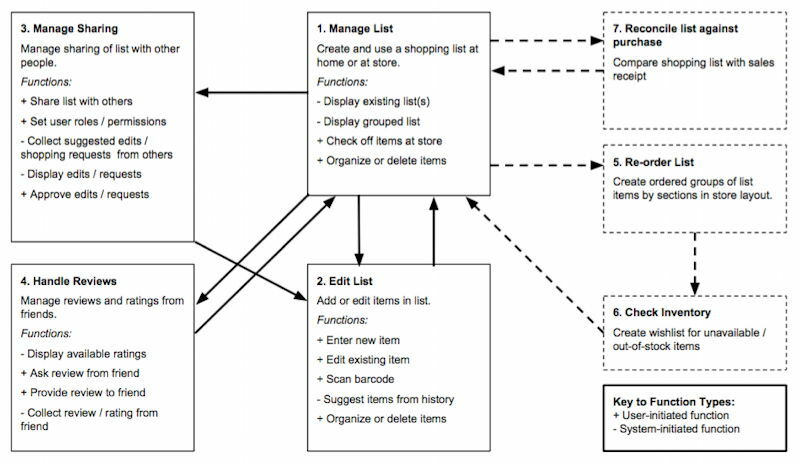 Flow Model ‒ represents communication and responsibilities among various roles involved in the shopping experience, including any breakdowns. For example, the shopper interacts with other household members and store employees. 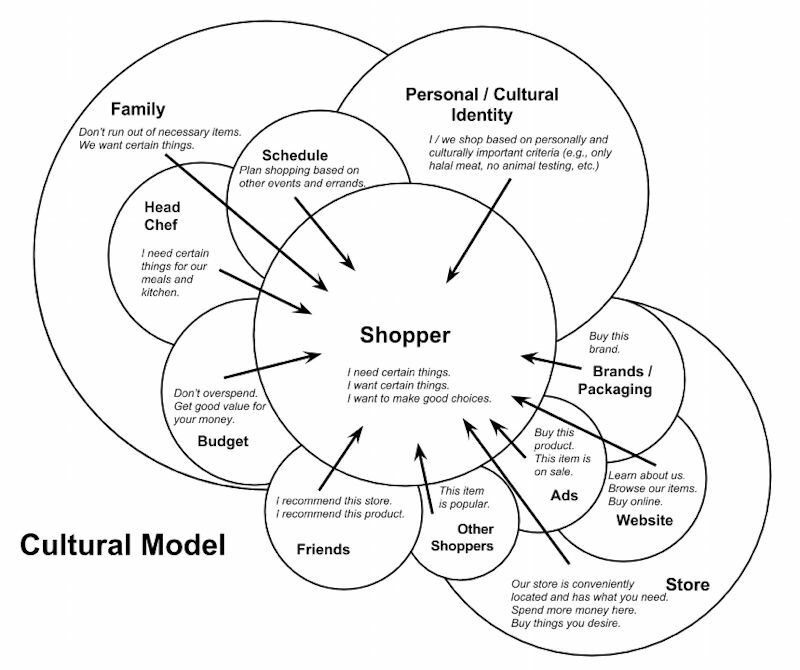 Cultural Model ‒ represents the various influences that affect the shopper. For example, shoppers are influenced by budget, schedule, advertisements, etc. Artifact Model ‒ shows tangible objects used during the shopping experience, including the artifact’s information, structure, presentation, as well as how the artifact is used and any breakdowns that occurred during its usage. For example, artifacts used by the shopper include a shopping list, coupons, etc. Physical Model ‒ illustrates the environment in which the shopping experience occurs, including the layout, movement within the environment, and any breakdowns presented by the environment. For example, the two primary environments in shopping are the home and the store(s). The work models from the individual users were analyzed and synthesized to create a set of consolidated work models describing all observed users. 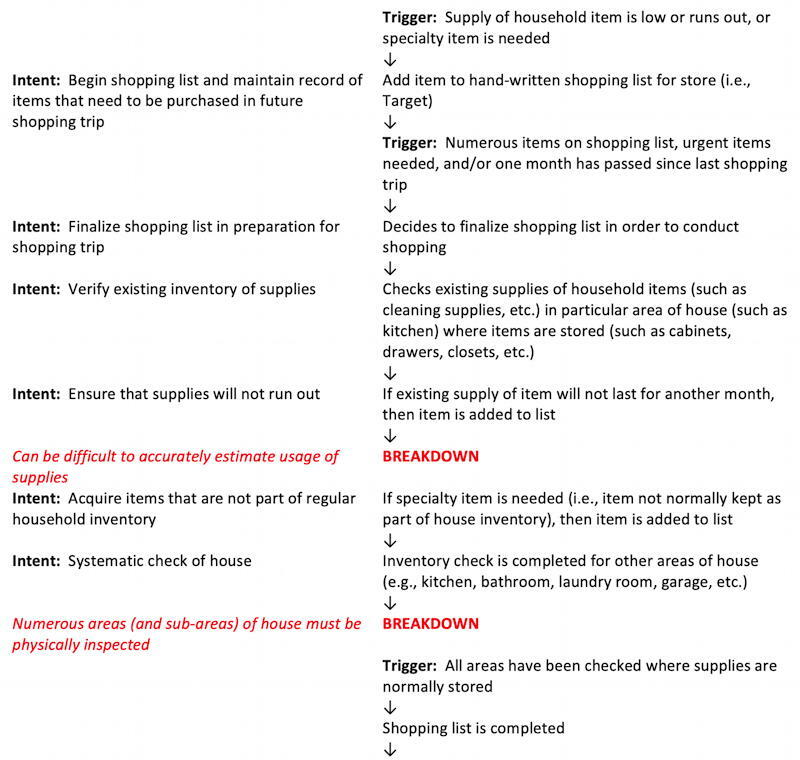 It quickly became apparent that there were many breakdowns associated with creating and using a shopping list, which is the primary artifact involved in the shopping experience. I created the set of work models for User 1, as well as the consolidated cultural model for all users. We used the interpretation notes from all the user observations to construct an affinity diagram that revealed patterns, themes, and topics that emerged from the user data. Our data revealed multiple breakdowns that negatively impact the shopping experience. My team compiled the most common breakdowns and then generated design ideas to potentially resolve them. T3. I check several key areas of my home for items to add to list. T8. Another person in my household has the primary role in determining the shopping list. T15. I sometimes cannot find items in the store or find the store layout confusing. T11. I carefully inspect and consider items that I am unfamiliar with. 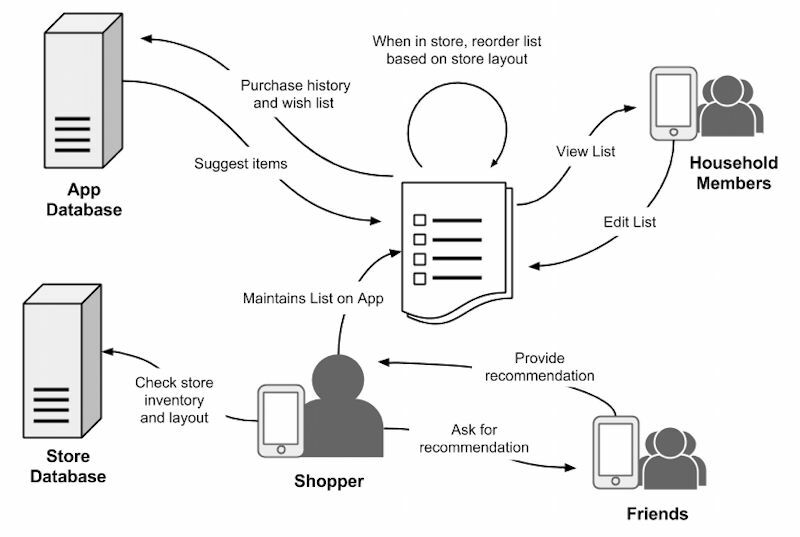 At home, the mobile app would support automated list-building through predictive suggestions, as well as collaborative list-building among the household members. In the store, the mobile app would support in-store navigation and inventory information, as well as reviews and recommendations from trusted sources. My team used our system vision to construct a User Environment Design (UED) diagram, representing a conceptual design for the mobile app’s interface screens and functions. 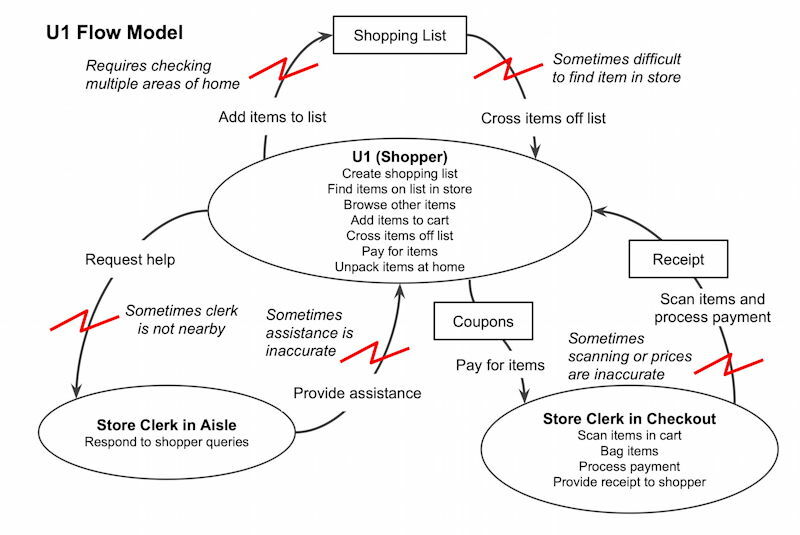 The UED diagram could then be used to create wireframes and an interactive prototype for the mobile shopping list app. Contextual design is particularly well-suited to understanding information-intensive tasks. While the full methodology may not be appropriate or necessary for all design problems, the emphasis on observing users completing tasks in real-life contexts is an invaluable approach, whether building a new solution or improving an existing solution.